HOLLY SPRINGS, Miss. – After rain washed out Thursday’s racing schedule and delayed Friday’s start, the 6th edition of the BTE Southern Footbrake Challenge raced into action late Friday afternoon at Holly Springs Motor Sports with the first of three $10,000 to win Footbrake races scheduled throughout the weekend. Over 150 of the best footbrake racers in the country took their shot at the $10,000 winner’s purse. A who’s who of bracket racing superstars made up the quarterfinal field which included Lucas Walker, Rodney Finchum, JD McNeal, Jody Simoneaux, Josh Green, Mitchell Reeves, and Little Phil Combs. At the round of 7 it was Walker over Finchum, McNeal over Simoneaux, Green over Reeves, and Combs with the bye. In the semifinals, McNeal used a 21-pack to defeat Walker while Green was 44 and two above to defeat Combs who broke out by -.005. 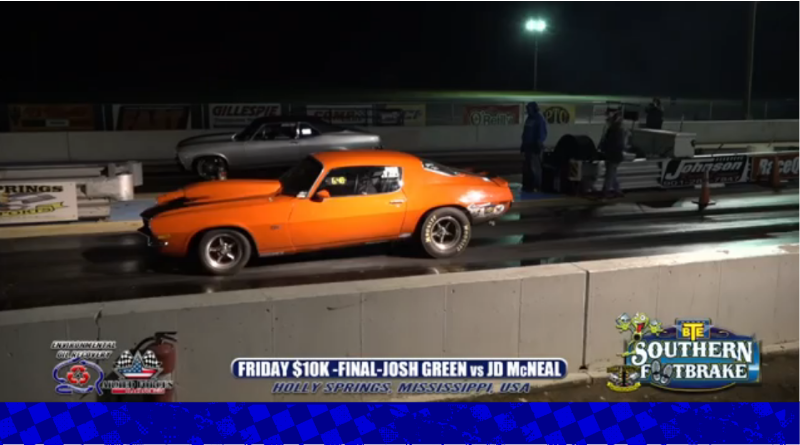 The final was over quickly as McNeal turned it 23 red handing the $10,000 win to Josh Green. With the bad weather behind them, the BTE Southern Footbrake Challenge should have beautiful weather for the remainder of the weekend. On tap for Saturday is the second of three $10,000 to win main events followed by a Gamblers race later in the day. Since we’re so close to Halloween, there will be Halloween activities for the kids tonight as well. To watch the BTE Southern Footbrake Challenge live online or see the event flyer, click here. Check back tomorrow as we’ll have more race results throughout the weekend. DragChamp is your source for sportsman drag race results. Visit DragChamp daily for the latest sportsman racing news, results, and updates from races all over the country.